The thought that might creep into one's mind when they hear that a fashion designer has directed a motion picture might be one of artifice, that they've concentrated on style above substance in how they've brought their talents to a storytelling medium. Tom Ford's soulful adaptation of A Single Man, Christopher Isherwood's novel about the lingering effects of losing a loved one, proved that the designer has far more tricks up his sleeve than the glamours and expression of aesthetics, instead paving the way for sheer enthusiasm toward his next project. Ford's second feature, Nocturnal Animals, channels the polish of his freshman film into a layered, challenging psychological drama that explores grief, redemption, and how humans perceive masculinity and strength themselves, wrapped around and interwoven within an unsettling story-within-a-story that amplifies its musings. Someone might not know how to feel about Nocturnal Animals based upon the peculiar art exhibition found at the film's beginning, yet even that has its own deliberate devices. The bold, in-your-face display is the work of artist and gallery owner Susan Morrow (Amy Adams), a considerable success in her industry who lives in a sleek, modern home with her second husband (Armie Hammer), a jet-setting businessman . One day, Susan receives a manuscript from her first husband, Edward, along with a note indicating that he'd like to meet and catch up. Amid coping with a lackluster marriage and insecurity over her artform, she delves into the novel: a thriller set in the empty outskirts of Texas, focused on a husband (Jake Gyllenhaal), wife (Isla Fisher), and daughter (Ellie Bamber) trio who are tormented by a crew of rambunctious locals -- led by a particularly sadistic yokel (Aaron-Taylor Johnson) -- while on the nighttime leg of a road trip. From the hollow, chilly polish of Susan's house to the dusty, night-cloaked roads and ramshackle buildings of rural Texas, Nocturnal Animals latches onto nuanced atmosphere with its aesthetics, yet veers away from being ostentatious ... unless the film demands it. Director Ford frames Susan in a dreary and disconnected attitude, overtly conveying that she's a sort of tortured artist yet doing so without sacrificing the credibility of her personality. She's surrounded by other kooky, life-loving artist friends -- Andrea Riseborough's Cleopatra-esque holistic disciple; Michael Sheen's purple-jacketed card -- but they also feel vaguely genuine underneath their flamboyance and their immaculately tailored personas, crafting an absorbing facade that reflects upon the aura of insecurity surrounding Susan's life. The shallowness has its own intentional layers, ones which are peeled back as the unhappy woman delves into her ex-husband's novel and the starkness of where his mind was at while writing it. 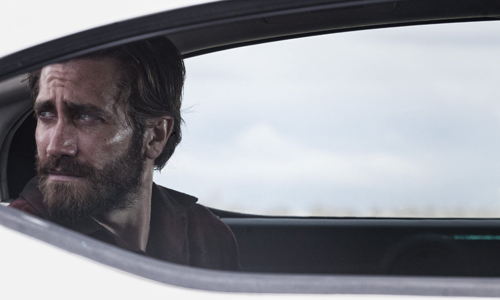 Nocturnal Animals shares its title with that of Edward's book, which in itself is a uncompromising thriller hinged on the empty reaches of Texas' nighttime highways and the unhinged nature of disturbed locals cruising through the darkness. It simmers with meaningful tension as the safety of a man's wife and daughter comes under duress, placing his lack of control of the situation under the microscope as things turn grimmer and more tragic. Unlike other films that utilize such a story-within-a-story, the mystery's terrifying downward spiral into anguish and vengeance truly draws one's attention toward what's going to happen next -- partly due to how it echoes the mentality of Susan's ex-husband, but also because Tom Ford has assembled this raw and meaningful depiction of powerlessness and violence here. Jake Gyllenhaal's performance might be predictably wide-eyed and haunted at most points, but the ways in which he handles the story's more unnerving twists and turns push him toward disarming levels of mania and trauma within the character's headspace, counterbalanced later on by the stiff diligence of the investigator played by Michael Shannon. The narrative structure of Nocturnal Animals is a thing of beauty once it falls into rhythm with Edward's novel, made interesting by the juxtaposition between what's happening on the pages and what the author intends for the audience, and Susan herself, to take away from its veiled allegory. Amy Adams' performance relies on delicate shifts from the emotionally cool frustrations of Susan's existence to the wistful tension of her shock and regret, strengthened by how sublimely Ford incorporates flashbacks to her prior marriage into the transitions between the real world and the one created by Edward's novel. Eloquently captured by Atonement and Pride & Prejudice cinematographer Seamus McGarvey and fluidly edited together to emphasize an intended mental space, this trio of timelines -- the present, the past, and the fictional -- create a sort of echo chamber within Susan that's absorbing to behold, illustrating where her ex-husband's inspiration might come from and how she interprets the nuances of the material. Director Ford gets a tad overzealous in the coexistence of the two, such as when a gunshot in the book is echoed by a bird slamming into one of Susan's windows, but it's easy to forgive a little modest usage of stylistic flair. Such things are even easier to forgive once Nocturnal Animals digs deeper into the potency of its thematic aspirations, which revolve around how masculinity and strength are viewed through a narrow societal scope, as well as how the impressions of others can poison viewpoints on that. Director Ford fires off these ideas without directly aiming them at an overarching point or clear emotional target, though, instead letting a range of interpretations about what constitutes "weakness" guide the film's melancholy tone toward its explosive culmination, one underscored by self-realization, hostility, and the lingering effects of undervaluing other people's capacities. Once the book's finished and the literary world fades back into reality, Nocturnal Animals leaves plenty to be deciphered in the sobering, open-ended nature of its conclusion and the pointed actions of certain individuals. The way it lacks clear answers and perpetually gravitates towards cynicism leave things in a harsh, cold emotional tangle, yet that's an appropriate part of what gives the substance of Ford's sophomore directing effort its edge.